Shimla, Oct 30 (IANS) BJP national President Amit Shah on Monday asked Congress President Sonia Gandhi and her son Rahul Gandhi to clarify party’s stand on separatists in Kashmir and illegal migration of Rohingyas, who are posing a threat to national security. 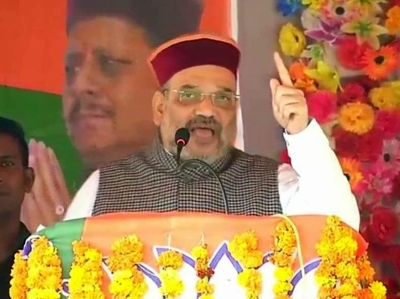 “The Congress leaders are supporting those who are raising slogans in favour of Kashmir’s independence,” Shah said at a public rally in Banikhet in Chamba district of the poll-bound Himachal Pradesh. Asking the electorates whether they were with those who are raising slogans for freedom, the BJP President, who started his five-day tour of the state on Monday, said thousands of brave soldiers belonging to this hill state had sacrificed their lives for the cause of Kashmir. “Why they should be allowed when the government of India is saying they are a security threat,” he asked. “Rahulji and Soniaji should come here and give reply on the issue. Himachal people and Gujarat people should ask them what is the Congress’ stand on the issue of Rohingyas. And what is the stand of the Congress on raising freedom slogans,” he said. Shah, who later addressed a public meeting in Jawali in Kangra district, said the Congress only promoted corruption, with scams worth Rs 12 lakh-thousand crore taking place in the previous UPA (United Progressive Alliance) regime. “In the last three years not even a single scam has come to the light,” he said. Shah accused state Chief Minister Virbhadra Singh of corruption and ruining the state. “The Congress regime (in the state) had only performed ground-breaking ceremonies and the day never come to inaugurate them (projects),” he added. Elections to the 68-member Himachal Pradesh Assembly will be held on November 9 and the votes counted on December 18, coinciding with the polls in Gujarat.